Okay, let's cut to the chase here. You are just starting Lacrosse, you are looking at all of the positions on the field, and you are wondering where you are going to fit in. Attacker, middie, defender or goalie, you may think you are right for a certain position, but your skill set, your body style or your mind set may make you better for somewhere else. So, let's go over the positions and see where you might work out best. Attacker -- Not only do you have to have exceptional stick handling skills, but you have got to be a killer shot on goal. You must have an in-your-face attitude, and then you have to back it up. You can't be afraid to stick your nose in the action, and when you do, you better make the shot. That's what makes a good attacker, and if you are a little bit cocky, so much the better. Midfield -- Your stick handling must still be awful good, but first and foremost, you must be a runner. Middies run up and down the field setting everything up, so you have got to be long winded, but most importantly, you've got to be able to pass the rock effectively. Although you'll get some shots on goal, it's primarily your job as a midfielder to get the ball to an attacker and let them take the shot. You cannot be selfish here, so if you would rather pass the ball and make the play happen, then being a middie is right for you. 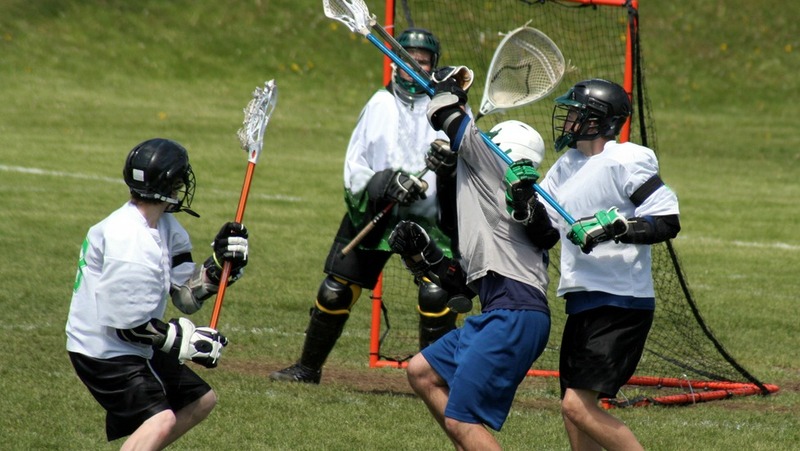 Defender -- This is the backbone of any Lacrosse team, and if you like sticking your helmet into the thick of things and have no fear, a defender might be right for you. You can be bigger and less mobile here, your stick work doesn't have to be great, but your aggressiveness does, and if you think of yourself as an enforcer, the defense is probably your style. Goalie -- If athleticism is your forte, then you'll fit right in as a goalie. Hand-eye coordination is the key at this position, but being nimble and quick are also an absolute must. Regardless of any stick handling skills you have or do not have, if you can get in the way of the ball and keep it from going in the net, than being a goalie is where you'd be best suited. FOGO -- This is the most specialized position in the game, and if your skill set is limited, but you are quick on the draw, you may qualify as a FOGO. (That stands for Face Off and Get Outace Off and Get Out, by the way.) All this position needs to do is win the face off, and that's it. If you do nothing else but practice clamping, pinching and raking, and you are quick enough to get away with it time and time again, you could, literally, come in for the face off, win it and get the ball to your team, then get off the field. The above mentioned are the basic positions, but one more thing needs to be said. It doesn't matter where you want to play, what your skills are or whether or not you can handle a stick. What you must have, more than anything else ~ is desire. Lacrosse is a team sport, and the most important position and mindset is being a team player. Put in your practice time, both with your team and alone, support your teammates and coach. Those are the first Lacrosse positions.